Ian Redmond, chairman of both Ape Alliance and The Gorilla Organization, visited Egypt 3-6 March with funds provided by PEGAS. The purpose was to follow up on matters arising from the visit made in November last year by PEGAS. One of the priority matters is the freeing of the approximately 25 chimpanzees held at the Safaga Breeding Center, owned by Gamal Omar, a wealthy Egyptian businessman with close links to deposed President Hosni Mubarak, and friends with Tony Blair, former UK prime minister. 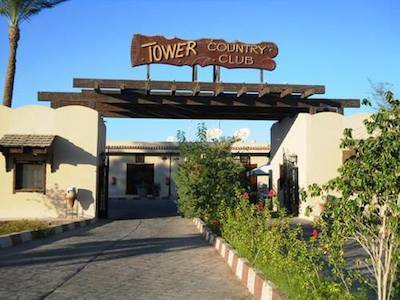 Mr. Blair owns two properties in Sharm el Sheikh not far from the breeding centre and he is a visitor to Mr. Omar’s Tower Hotel & Country Club, where the breeding facility is located. All of these chimpanzees were either imported illegally, or are offspring of the trafficked apes. Ian gathered some very useful information during his necessarily brief visit. He first went to the Giza Zoo where the Egyptian CITES Management Authority is located. 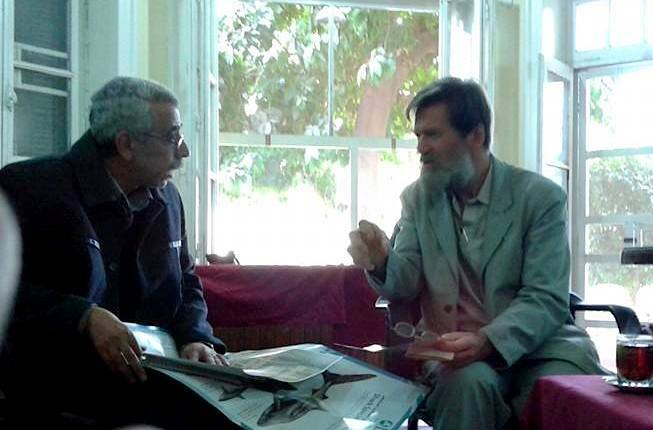 He met with Dr. Fatma Tammamm Mahmoud, Head of the Egyptian CITES Management Authority (MA), and Dr. Ragy Fakhry Toma, General Director of the Egyptian Wildlife Service and Deputy Head of the CITES MA. In a meeting in Dr. Toma’s office, Ian was shown the microchip registration document that lists all of the “legally” held great apes in the country. Dr. Toma only showed the details of the chimpanzees held in the Giza Zoo and those held by Ashraf Enab, owner of the breeding facility formerly known as Utopia and now named the Egyptian Agricultural Farm, according to what Enab told PEGAS last November. The Giza Zoo lists 7 chimpanzees, although one female, Mouza, died the day before Ian arrived from a longstanding medical condition. 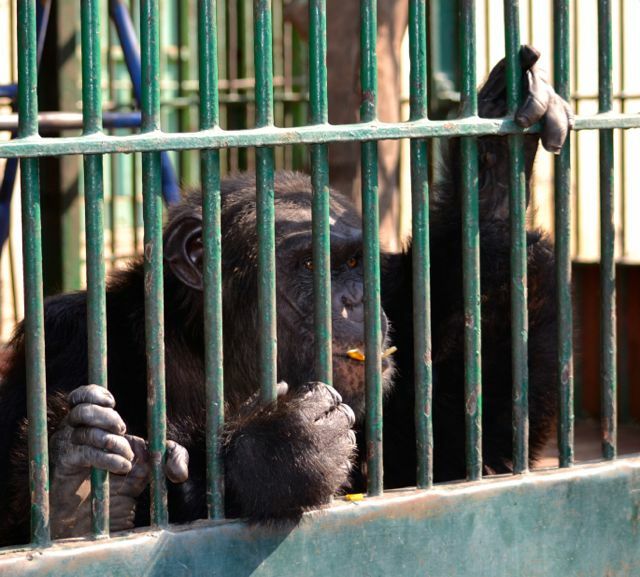 There is supposedly a new resident of the zoo, a baby chimpanzee seized at the Cairo airport on 8th February this year. More will be said about this baby below. A visit to the Giza Zoo by PASA in 2009 noted that there were 8 chimpanzees there, while other visits by anonymous investigators reported by Karl Ammann stated that in early 2010 there were 3 young chimpanzees and in early 2011 there were 4 young chimpanzees, plus Mouza, who arrived in April 2010 from Safaga Breeding Center, as she could no longer breed due to her illness. Unfortunately, the Ammann reports are not complete enough to know whether the three and then four young chimpanzees (plus Mouza) observed were the total number. Dina Zulfikar reported that some chimpanzees were moved temporarily to Alexandria Zoo in 2010 and returned to Giza Zoo in 2011. Hilda Tresz reported in October 2011 that there were 7 chimpanzees at Giza Zoo, including 3 infants with a pair of surrogate ‘parents’, plus 3 males at the Alexandria Zoo. PEGAS reported 7 chimpanzees in Giza Zoo in November 2014, which was confirmed as the total from knowledgeable informants. There were none in Alexandria Zoo, one was said to have died. That still leaves 2 chimpanzees unaccounted for from October 2011 (7 at Giza, 3 at Alexandria, 1 died). Koko, said to be a long-standing inhabitant of Giza Zoo. Mr. Enab told PEGAS in November 2014 that two chimpanzees had been born at his breeding facility recently and that now he had 8. Given the ages of the females, producing offspring would be highly unlikely. Chimpanzees normally have their first offspring at 13-14 years of age. No female had even reached 11 years of age by last year when the births supposedly took place. This suggests two baby chimpanzees were added in 2014 illegally to Enab’s breeding facility. Dr. Ragy said that the Africa Safari Park had 4 chimpanzees, which if true means that one has been added since PEGAS visited last year. Where did it come from? Safaga Breeding Centre was reported to have 17 chimpanzees, but Dr. Ragy declined to show the details (the official permit list is shown in the News report of the PEGAS Egypt visit). PEGAS confirmed that Gamal Omar had 25 chimpanzees at Safaga in November 2014. Ian attempted to see the seized baby chimpanzee that was supposed to be in the Giza Zoo, but was told that the baby was ‘settling in’ and was being kept in the indoors quarters of a cage that was empty (PEGAS also observed an empty cage in the chimpanzee section of the zoo). 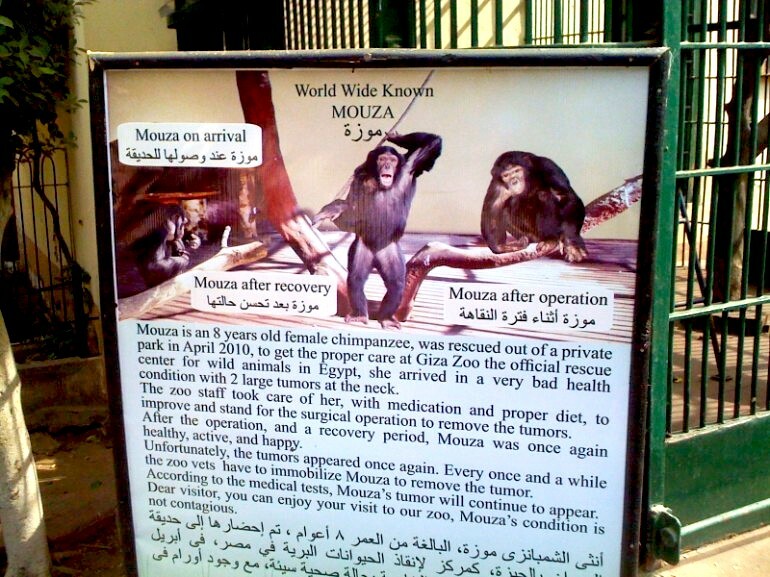 Is the seized chimpanzee still in Giza Zoo? There have been various versions of the circumstances surrounding the seizure of the baby chimpanzee. Dina Zulfikar, a well known animal welfare activist in Egypt, questioned publicly the government’s handling of the seizure case, which elicited official responses from different government offices. Dr. Ragy gave Ian his version, which differed somewhat from the official written responses. The seizure actually occurred at about 9 p.m. on 8th February during the passenger departures security screening, not on 9th February as reported in the press. A Kuwaiti man was carrying a baby chimpanzee in a pet transport carrier, intending to fly to Kuwait on Egyptair. Security considered it a potential risk to passengers and apparently airport police and a wildlife veterinarian were summoned. The written documents stated that the Kuwaiti man was unaware that it was illegal to export the chimpanzee without CITES and health documents so “the police dismissed the passenger”, according to Dina Zulfikar’s translation provided to PEGAS. Zulfikar insists that no proper police report was filed with a tracking case number, though the government reply stated that a memo report was made by the airport police. Dr. Ragy stated that the trafficker was fined according to Article 84 of Law No. 9 of 2009, therefore proper procedures were followed. The written replies make no mention of this and state that the airport police applied Law No. 4 of 1994 and Law 1150 of 1999 to justify seizure of the chimpanzee and its transfer to Giza Zoo. Ms. Zulfikar continues to call for prosecution of the Kuwaiti trafficker and repatriation of the baby chimpanzee to its country of origin, as determined by DNA testing, in conformance with Article VIII of the CITES convention. Dr Ragy agreed that a DNA test should be taken to determine which sub-species of chimpanzee it was and its likely area of origin, and that repatriation to a suitable sanctuary would be the best outcome. 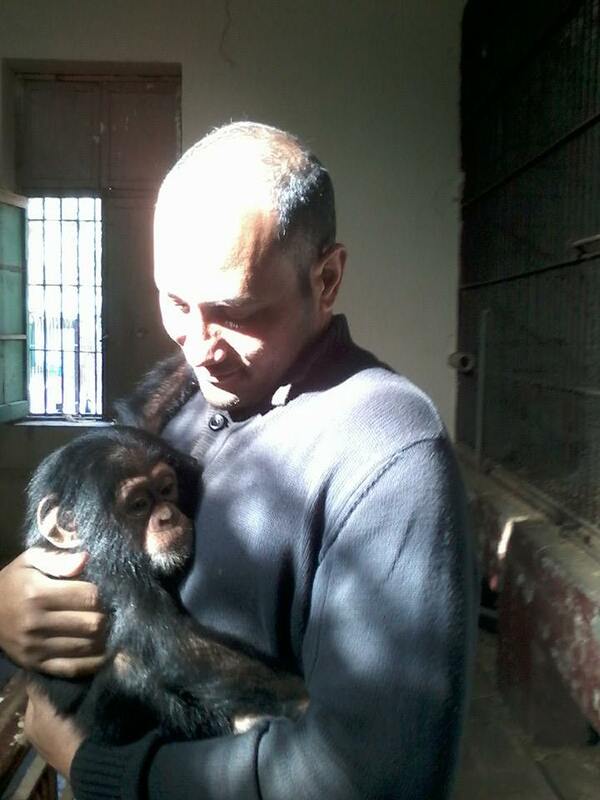 The seized baby chimpanzee with a veterinarian at the Giza Zoo at the time it was deposited. Is it still there? The chimpanzee’s country of origin is being treated by the authorities as Egypt, however. They are using this to explain why no quarantine was carried out. Dr. Ragy told Ian that the Kuwaiti man had obtained the chimpanzee from a Saudi resident in Egypt. If Dr. Ragy knows this, why isn’t the Saudi being investigated for illegal CITES Appendix I species trading? There are many inconsistencies in the Egyptian government accounts. After Giza Zoo, Ian attended the 15th African Ministerial Conference on the Environment, which was taking place in Cairo. He had the opportunity to inform a CITES officer who was attending of the chimpanzee seizure, and brief Achim Steiner, Executive Director of the UN Environment Programme, and Bradnee Chambers, Executive Secretary of the Convention on Migratory Species, on the purpose of his visit. PEGAS hopes that CITES will investigate further the continuing illegal movement of great apes into and out of Egypt. The Safaga Breeding Center has 25 chimpanzees and 3 gorillas. This means that two gorillas have been disposed of since late last year. Enab confirmed that Omar had sold one male that he was aware of. Where did they go? Enab believes that the baby chimpanzee seized at the Cairo Airport originated in the Safaga Breeding Center. DNA testing could provide proof that the baby was bred at Safaga. Omar sells chimpanzees for USD 10,000 each. Omar promised that Ian could visit Safaga, but in the end the visit did not materialize. Ashraf Enab repeated his willingness to acquire the chimpanzees and relocate them to a sanctuary, subject to Gamal Omar being willing to allow it. Gamal Omar seemed open to collaborating, but did not commit to anything and said he needed to check with his Minister (the Minister of Agriculture, under which CITES is located and Safaga’s holding permit emanates). No chimps have been imported to Egypt in recent years because of the revolution in Libya; they used to come from Nigeria, Niger or Sierra Leone, on Afriqiyah Airlines flights from Tripoli, but the civil war put a stop to that (flights have been suspended). 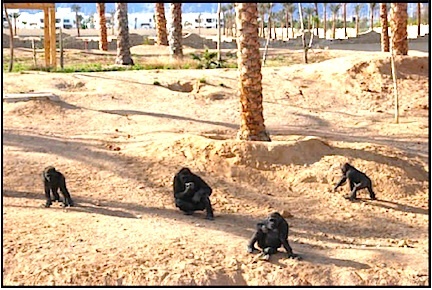 Only three private facilities are licensed to keep great apes in Egypt, those of Enab, Omar and the Africa Safari Park. It is clear that in spite of two visits by the CITES Secretariat to Egypt (2007 and 2010) and numerous promises by the Egyptian government to halt great ape trafficking and to take action when it occurred, that it is business as usual. The Safaga Breeding Center is producing great apes for sale with the blessing of CITES-Egypt. It is well past time that the great apes acquired illegally and held captive at Safaga be freed. They should be sent to appropriate sanctuaries, preferably in their countries of origin. DNA tests should be carried out immediately, as CITES-Egypt promised to do at the 15th CITES Conference of the Parties. They have so far reneged on their promise. CITES-Egypt has been written to recently requesting DNA testing and repatriation of the seized baby chimpanzee, copied to the CITES Secretariat and GRASP. We await a reply. This entry was posted in Egypt and tagged ape rescue, captive apes, Egypt, illegal trade. Bookmark the permalink.